Getting the swimming pool of your dreams is easier than you think, thanks to Aqua-Tech’s process. As you begin your journey to investing in a stunning, custom swimming pool from Aqua-Tech, you’ll likely wonder exactly what you can expect over the course of the design and installation. Our process has been developed over the course of our three decades in business to ensure that the installation is as seamless and stress-free as possible. We want to build you a better place to come home to, without inconveniencing you as we do it. We’d encourage you to visit our showroom and see some of our pools in person–an opportunity that’s completely unique to Aqua-Tech. You’ll get a sense of the exacting detail and tremendous quality that you can expect from your new pool. Next, you’ll make an appointment with one of our consultants to determine how we can bring your perfect pool to life based on your budget, available space, property shape, and your needs. From that point on, we’ll work together to make your dream a reality. Once we understand your needs, you’ll begin to work with one of our designers to determine the shape of pool, the depth, materials, which custom features you’d like to add, how your pool with flow from your home and the best landscaping for the space. 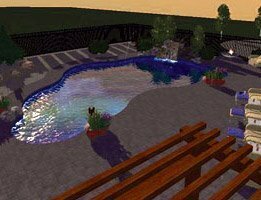 To help bring your dream to life, we then create a 3D model of your pool and backyard using sophisticated 3D design software. This enables you to visualize your future backyard and gives you a clear sense of your investment. Aqua-Tech visits your property to draw the outline of the pool in your yard, providing you with the opportunity to determine the optimum position to ensure maximum sun exposure and see how a landscape design will enhance the final result. After you’ve accepted our offer, we’ll set the timelines for the work and get started. Your installation is undertaken by our in-house team–we never contract out any aspects of the project. The work is supervised by the senior management team who combined have over 60 years of experience in the design, construction and maintenance of swimming pools. Further, Aqua-Tech has added items such as custom concrete and fencing to it’s expansive in-house activities so you don’t have to look any further than our skilled team for designing the concept, executing the design and finally to filling it with water. This also helps you to feel confident that every aspect of your pool is completed by a member of the Aqua-Tech team, so you’ll always have one point of contact in the midst of the project who you can speak to. 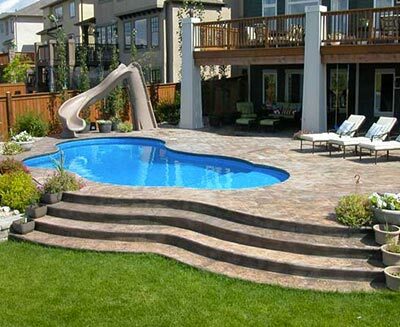 Once your pool is in place, we’ll begin with the landscaping. Landscaping can have a enormous impact on how you feel about your pool, and how much time you want to spend in your yard. Our expertise extends beyond the pool wall and into grass, and we can create the ultimate backyard escape for your and your family. Our Maintenance Team can help you with every aspect of upkeep including pool openings and closing, Green to Clean, ongoing weekly maintenance. We know you want to spend your time in it, not cleaning it so let us do that for you! Ready to kick off your pool installation process? Get in touch today!